Today there is another announcement in Kuensel. It was of course from MoIC. 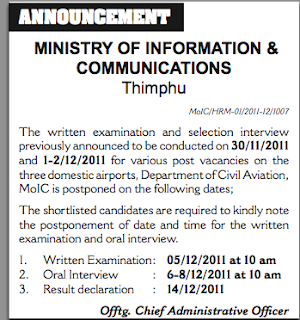 The written exam, which they announced to be conducted on November 30 now stands postponed. 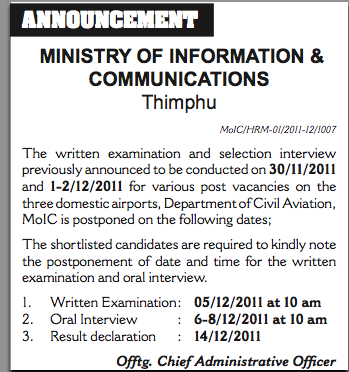 The ministry, I was told, called all the shortlisted candidates asking them to be there in Thimphu. Many I assume must have rushed to the capital yesterday. But now, it is cancelled? How did that happen? If deadlines can be as flexible as that then one would not miss so many opportunities in life! Do you smell something here? Maybe some powerful people's relatives could not be in Thimphu in time to attend the interview. This may not be true, but it appears like that now. Right or wrong, anyone has the right to assumptions until the real truth is out. By the way, the ministry's website isn't updated even when this cancellation of examination is announced in the media.